This mouse led us a very merry dance! When we first began to take an interest in Canada geese in May 2003, goslings had already appeared at the pond, little strings of waddling, tumbling, furry, olive gold handfuls toddling along between their parents. More parents appeared with their fuzzy charges and soon the pond was full of sweet whistling cheeping sounds, as goslings investigated their new world on land and water, always watched over protectively by both parents. The following April, when Canada geese had already returned from the south, we discovered that the pond was, for the most part, devoid of geese. Where were the geese? we wondered. And where were they nesting? While out shopping one day, we noticed a few pairs of Canada geese feeding on dried stubbles of frozen grass at an empty lot a few blocks from our home. We started to visit this lot daily. In mid-April, we stumbled upon a goose's nest right in the middle of a parking lot. The goose had built her nest on one of the concrete islands. She had used the roots of the sapling as the base for her nest. The nest was made up mainly of pine needles, dried grass, bark, and some twigs. Sadly, someone stole all her eggs the following week. While visiting another shopping mall close to our home, we spotted another pair of Canada geese. We fed this pair and a few days later, we noticed the gander standing alone. We scanned the area for his goose and finally spotted her deep in a dense patch of weeds about thirty feet from her gander. A few days later, we noticed a flock of Canada geese milling about on an empty lot next to the shopping mall. For the first week, we thought they were unmated geese. They appeared to have no tolerance for each other, often chasing each other aerially or on land, sometimes engaging in ferocious neck-to-neck, wing-to-wing battles. One of the Canada geese wore a yellow band with 86P engraved on it. One day, he was joined by another goose and the pair appeared to be overjoyed, running about, honking, chasing other geese. Then, as we watched his mate, she ran to the water, bathed herself thoroughly, beat her wings, bathed some more, then trotted about twenty feet away, and stood dripping over what looked like her nest! That's when we realized that the Canada geese who milled about on this empty lot were ganders who were doing their husbandly duty - protecting their "wives" while they were nesting. We had discovered their nesting grounds in an isolated and secluded area close to this shopping mall. They used to nest where this shopping mall sat, but their nesting grounds had been pushed farther and farther back as the city grew, taking up their nesting sites. They had made their nests along the shore of shallow potholes that were filled with melted and melting snow. This would be their source of water until they left the nesting area for the pond. The nest site was about a half-mile to two miles (depending on their travel route)from the retention pond where they would eventually raise their young. Although yearling (one-year old) Canada geese have attempted to nest, none have done so successfully. 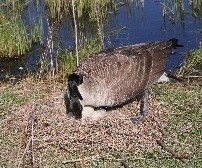 Canada geese usually begin nesting when they're three years old. 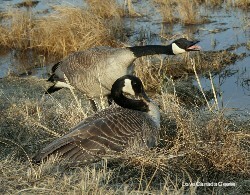 Nesting Canada geese build their nests with dried grass and reeds piled about 6-12 inches off the ground. Most of the nests contain between four to seven eggs. This year, Smoky had 12 eggs but I suspect that another goose might have dumped her eggs in Smoky's nest! I had found abandoned eggs lying right out in the open close to Smoky's nest. The eggs could have been laid by an immature goose who wasn't ready to have a nest this year. A Canada goose egg is about three times the size of a chicken egg and weighs about 5 ounces. Nests are spaced about 30-50 feet from each other and ganders patrol their territory, seldom venturing into other gander territories. The most agressive ganders maintain the largest territories. This year, OBL, the most agressive gander along the nesting grounds, had a territory of at least 250 feet! Some Canada geese camouflage their nests very well, building them deep within dense reeds, with surrounding water for protection. Others build their nests out in the open. At first, we thought only immature Canada geese had their nests out in the open because they didn't know any better or didn't have much nesting experience. However, we've discovered that mature Canada geese do that, too. Mrs. Chester has her nest out in the open. She had eight goslings last year so she is not an immature nester. Canada geese pop up and down on their nests, flipping their eggs over with their bills. Every hour, they stand up, rotate the eggs, push them together with their feet, and settle down to continue incubation. Incubation lasts about 25-30 days. 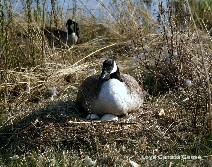 Most Canada geese remain on their nests for 23 out of 24 hours, taking short nesting breaks to stretch and feed. Others may take longer nest breaks lasting up to an hour or more. They're a lot of fun to watch when they take nesting breaks. They cover their eggs with down and grass, then race to their mates, who are overwhelmed with happiness to be with them again. Together, they honk as they fly into the water where she dips and bathes herself, drinks, feeds, stretches, chases other geese for exercise, and is as happy and active as she can be. Nesting breaks are short, usually lasting about ten minutes though some geese take long breaks of an hour or more, and soon, she trots back to her nest, stands dripping over her eggs while she preens herself, plucks soft down from her breasts to line her nest, and then settles down to continue incubating her eggs. The gander seems to know when his goslings are about to hatch because the day they hatch, he leaves his sentinel post and goes to stand beside his "wife" like a proud father awaiting the arrival of his child. Last year, we noticed that most parents left the nesting area the day after their goslings hatched. They would appear at the park pond between two to fourteen days later. The other parents raised their goslings at the nesting site until mosquito spraying began in earnest on the waters of their shallow potholes (when their goslings were about 3-5 weeks old). We couldn't figure out if the geese left because of the loud helicopters or because the application of insecticide caused their water to taste bad. Why do some parents leave the nesting area almost immediately while others stay? We can only speculate on this. Females are the ones who choose nesting sites and they usually choose to nest in an area where they were hatched. Perhaps their parents had taken them from the nesting site soon after they were hatched? The other females might have been raised at the nesting site and so they continue to raise their goslings there? Or perhaps some geese are aware of the dangers of raising their kids at the nest site, having experienced the danger when they were goslings or when they had a previous clutch of goslings. This year, for example, 86P and his wife raised their goslings at the nest site for over a week. We thought they were going to continue to raise their goslings there. Typically, parents who left the nest site did so right away and they wouldn't stay at the nest site for a whole week. The following week, two of 86Ps goslings were killed by a train as they attempted to cross the tracks. We watched in horror as it happened. The grief stricken parents left the nesting area with their remaining goslings immediately. They ended up at the park pond two days later. It remains a mystery to us how they and other parents walk their goslings to the park pond from the nesting site. Depending on their nest site, the park pond is about 1-2 miles away. That may not sound like much; however, they have to cross many busy streets and encounter dogs, cars, trucks, buses, people, bikes - you name it - to get to the pond. Very young goslings (less than 2 weeks old) need to be warmed up beneath their mother's wings every 15 minutes! We cannot imagine how the parents are able to trot with their tumbling goslings from the nest site to the park pond with all the hazards they face and the need for the goslings to be constantly warmed by their mothers!